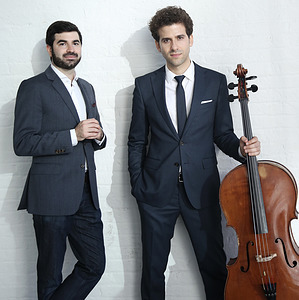 Hailed as “a pair of adventurous young talents” (Time Out New York) who “play with their antennae tuned to each other” (The Washington Post), cellist Nicholas Canellakis and pianist-composer Michael Brown have been captivating audiences with performances that combine masterpieces from the standard repertoire with original compositions and arrangements. The Duo recently toured the United States with a program of all American composers, culminating in a New York City recital presented by the Chamber Music Society of Lincoln Center. Mr. Canellakis and Mr. Brown regularly perform at leading music festivals, including Music@Menlo, Bard, Ravinia, Bridgehampton, Santa Fe, La Jolla, Moab, Saratoga Springs, and Music in the Vineyards. Their debut duo album, Out of Darkness, featuring works by Barber, Shostakovich, Brown and Canellakis, was released on CAG Records. Mr. Canellakis and Mr. Brown are both artists with the Chamber Music Society of Lincoln Center, having been winners of the Society’s CMS Two international auditions. Both maintain active solo careers, performing concertos throughout the U.S. each season. Mr. Canellakis, hailed as a “superb young soloist” (The New Yorker), made his Carnegie Hall Stern Auditorium debut in 2015 as soloist with the American Symphony Orchestra. Mr. Brown, described as a “young piano visionary” (The New York Times), is a 2018 Emerging Artist of Lincoln Center and a 2015 Avery Fisher Career Grant recipient. Mr. Brown is also a critically acclaimed composer who has written works for Mr. Canellakis; as Composer-in-Residence with the New Haven Symphony for the 2017-18 and 2018-19 seasons, Mr. Brown has been commissioned to write a new symphonic work with Mr. Canellakis as soloist. Mr. Canellakis is a filmmaker and actor, and he and Mr. Brown produce and star in a comedy web series called “Conversations with Nick Canellakis,” in which they conduct satirical interviews with stars of the classical music world. All of their videos can be found on their websites, nicholascanellakis.com and michaelbrownmusic.com. The Canellakis-Brown Duo is represented worldwide by Sciolino Artist Management www.samnyc.us.